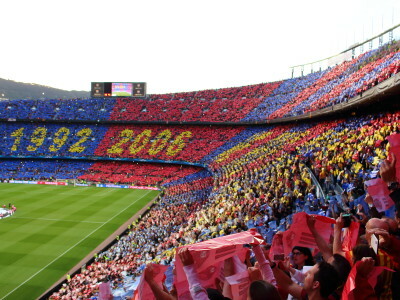 With this package your group can be mesmerised and watch FC Barcelona play in their own stadium – an amazing, unforgettable footballing experience. Also, what better time to watch them for the football-mad stag than on his own stag do in Barcelona?! Through our network of contacts and local knowledge, we can help you to get the best tickets according to the dates you need. Get in touch with us to find out about prices, availability and fixtures, and we will do all that we can to make sure you get to see the magical FC Barcelona play at Camp Nou! As you might know, games are usually played on a Sunday evening but they are sometimes moved to the Saturday instead. With so many logistical considerations to make, FC Barcelona only confirm times and dates for each match 7 days before kick-off! For us to guarantee you tickets, you must pay the full ticket price in advance. It is tricky with so many season ticket holders and the popularity of games, so do try to book as early as possible. Because of the way tickets are purchased, we can’t guarantee that groups will sit together though of course, we try our best!